There is no more gray area when it comes to the formation of inbound links. Certain practices are flat out disallowed, and can get your site slapped with an official Google penalty. Other tactics will signal to Google’s algorithm that your website doesn’t deserve its current ranking position. Dallas – Fort Worth SEO can help you avoid such fates with our internet marketing services. Call 800.231.4871 to learn more about earning quality links. The best practices for earning inbound links align perfectly with modern search engine optimization. Many of the optimization techniques once used by marketers are obsolete and now considered black-hat SEO. That term refers to optimization that is manipulative in nature, and compromises user experience in some way. Cloaking, link schemes, sneaky redirects, and other actions, can hurt your website way more than they can help it. By partnering with DFW SEO, you ensure your company uses only ethical optimization methods. If you have more quality links than your competitors, but are still falling short of them on search results, it could be due to multiple reasons. First, make sure your on-page optimization is perfect. That means proper placement of keywords, a URL hierarchy, image alt text, and more. Second, you must be patient. Google is constantly evaluating web pages and how they appeal to users. If you consistently follow best practices, you will eventually outrank competitors who fail to do the same. Longevity is also a consideration for web pages. Moz has metrics called domain authority and page authority which measure the likelihood of a domain and page’s ranking potential, respectively. Impatience might tempt us to accelerate the process through manipulation, but you’ll regret it sooner rather than later. Instead, trust the process, and start by investing in internet marketing services from Dallas – Fort Worth SEO. Call 800.231.4871 to learn more about earning quality links. 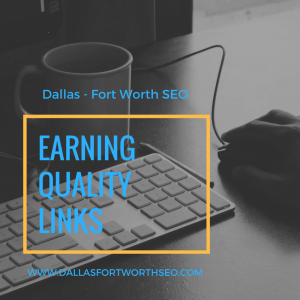 Updated on April 6, 2018 at 9:53 pm by Dallas / Fort Worth SEO.